What Makes School Great? FRIENDS! By: Patricia Schetter, M.A., B.C.B.A. and Victoria Murphy, M.S., B.C.B.A. Click on the above image to view larger version. 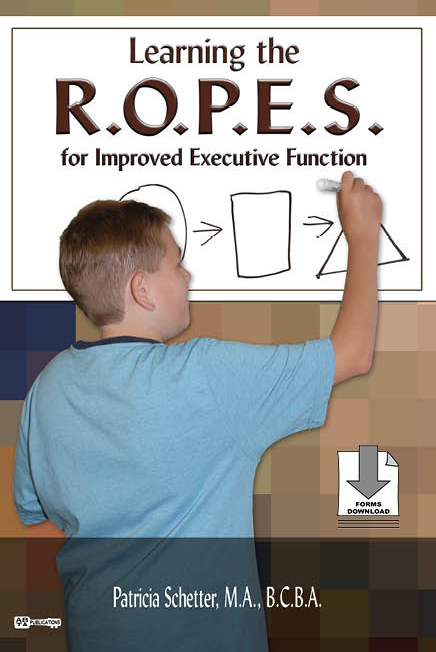 All the lessons in this curriculum were derived from the concepts found in the book Learning the ROPES for Improved Executive Functioning Skills (Schetter 2003). Each unit begins with an objective followed by lessons which are broken down into activities to build students executive functioning skills. The Scope and Sequence section of this curriculum will provide an overview of all the lessons and activities. A year long program may be developed from the Scope and Sequence. All student activity forms may be downloaded for classroom use. By: Patricia Schetter, M.A., B.C.B.A. Something NEW for Learning the ROPES!! This book is now available from Ingram Sparks. 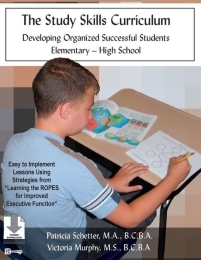 Learning the ROPES is now available online on Amazon in paperback and e-book, and on Barnes & Noble in paperback. 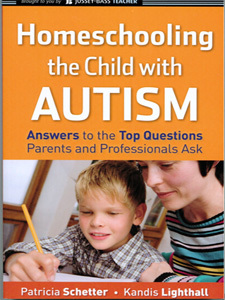 The book is still full of useful worksheets and graphic organizers, that are uniquely designed to capitalize on the visual strengths of children with high functioning autism and Asperger Syndrome to assist them in learning how to "think through" complex situations using these visual maps and structures as their guide. 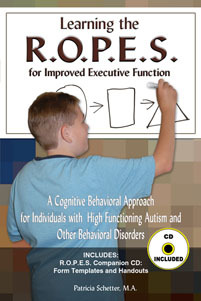 Many case studies cited provide the reader with "real life" examples of the successful implementation of the strategies presented from primary grades through adulthood. 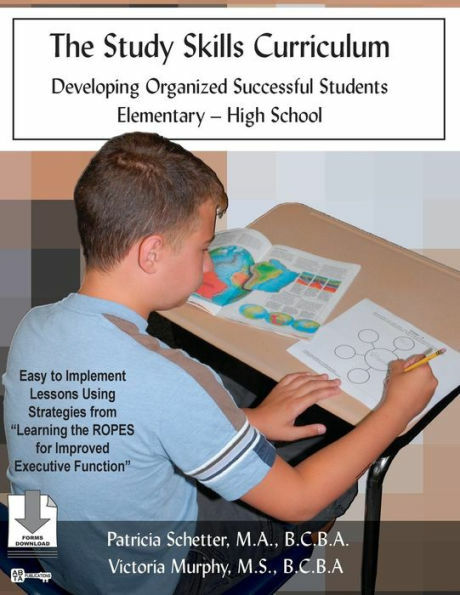 Educators have commented that the strategies are also very helpful to learners who have ADD, ADHD, learning disabilities, and the typical student who struggles with organization. Something NEW for READY for Inclusion!! This book is now available from Ingram Sparks. Successful inclusive education does not occur just because a student with special needs is placed in a general education classroom with typical peers. Success in an inclusive placement requires through preparation and on-going support. The ideas presented in R.E.A.D.Y. for Inclusion are based on the author's career long experience implementing inclusive education, and her knowledge and understanding of ASD and other disabilities. R.E.A.D.Y. for Inclusion is a resource that provides an educational team with all of the necessary components of a step by step process for the assessment and the implementation of successful inclusive education for students with Autism Spectrum Disorders or other special needs. At the end of each chapter there is an extensive reference list to support the reader in expanding their knowledge through selected readings specific to their individual needs and situation. R.E.A.D.Y. for Inclusion now offers an option to DOWNLOAD every form and tool presented in the manual in a printable format and a fill-in format. The fill-in forms also automatically compute all the scoring calculations simplifying an evaluator's work. Written By: Patricia Schetter, M.A., B.C.B.A. 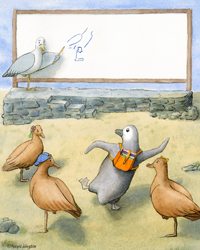 Meet Percy, his family, classmates and teacher, all residence of Gull Island. Everyone can see Percy is different. He tries hard to fit in with his friend and do well in school. 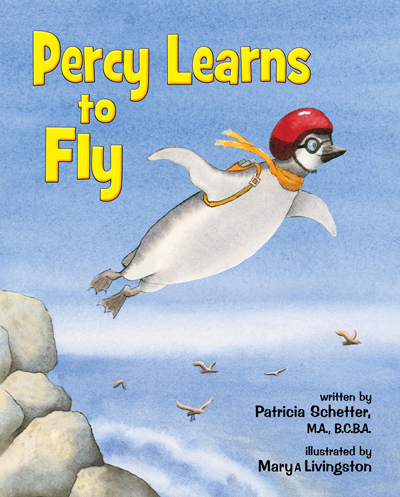 This heartwarming tale will captivate readers of all ages with moments of disappointment, excitement and joy as Percy Learns to Fly! 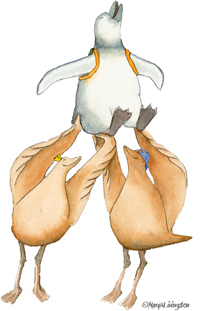 Readers will learn that Percy is a "Different Kind of Bird" but being different is not bad, in fact, it can make you even better than others at some things! 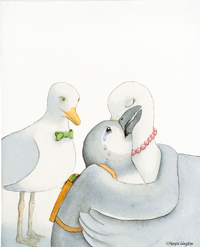 The beautiful illustrations help the reader feel Percy’s emotions as he learns about his own differences and strengths. Children will enjoy the story and Percy’s efforts to achieve. 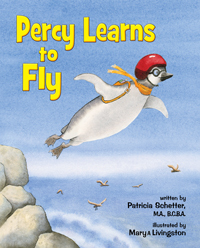 Many may personally relate to some of Percy’s experiences and struggles. Parents and teachers will appreciate the extra resources provided in the back of the book. Truly a book for all ages. Patricia Schetter, MA, B.C.B.A. and Kandis Lighthall, M.A. Forward by Jeanette McAfee, M.D. 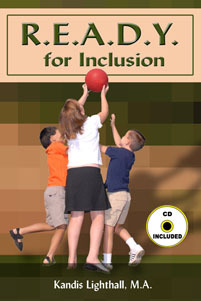 This wonderful resource is available in READY for Inclusion, Chapter 6, or as a stand-alone book. Peer Mediated Instruction and Interventions has been identified as an Evidence Based Practice by the National Professional Development Center ASD 2014, for promoting pro-social behavior in students with ASD. This book provides not only a framework for peers to develop plans for supporting their classmate with ASD, but also many other new ideas and activities for learning the student's strengths and interests which provides a foundation for friendship. What Makes School Great? FRIENDS! is appropriate for use by staff working with students from preschool through high school. The reader will find a reproducible ability awareness planning form very helpful in the basic organization of an activity. There are also many case examples for every activity and grade level, plus ideas for teachers and parents to make their own personalized awareness books. An extensive resource list is included to provide additional support for on-going awareness activities for students and staff. This publication provides educators and parents with ideas for making transient words and hidden thoughts visual, concrete, and 3-dimensional for individuals with ASD. The authors present many, easy to implement, methods using specially designed white boards to teach requesting, commenting, feelings, and perspective taking. 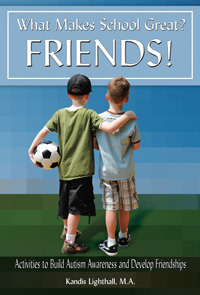 The reader will find activities for every age group from primary grades through high school. 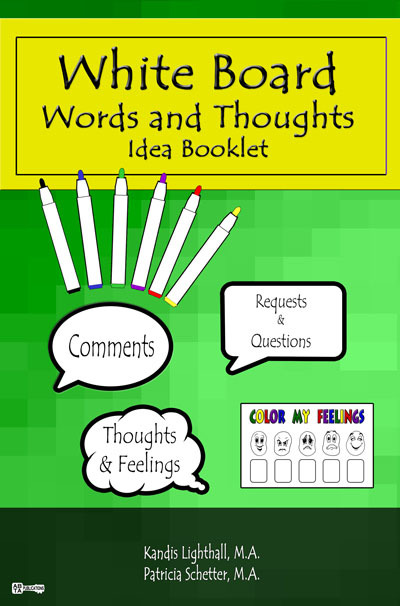 This booklet may be purchased alone or as part of the White Board Words and Thoughts Activity Pack which also includes the three specially designed white boards and other extras to use these strategies. See the Products Section of the website for more details on the Activity Pack. This new booklet provides educators and parents with ideas for using the circle-square-triangle graphic organizer in a visual, concrete, and 3-dimensional format for individuals with ASD or other learning differences. The authors present many, easy to implement methods for using this specially designed Thinking Tool. 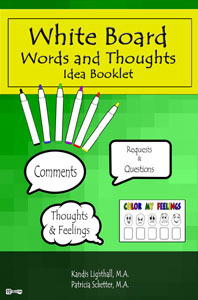 This booklet may be purchased alone or as part of the Thinking Tool™ Activity Pack which also includes five sets of circle-square-triangle cards and five Color My Feelings cards to use as a personalized tactile-kinesthetic tool. 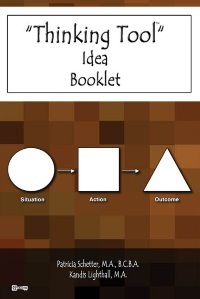 See the Products Section of the website for more details on the Thinking Tool™ Activity Pack.